26/11/2018 Under construction - feel free to add to the discussion in the comments. I’ve gathered together some cheaper scantools to compare in every day use. Keep in mind when reading online reviews of these scan tools the fact that many of the people writing these reviews of products they have purchased have no idea what they are talking/complaining about. Quite often you will read reviews like “Claims it can turn off the check engine light - did not work on my car!” followed by a 1 star rating - well Duh! You can’t just clear a fault code if it is permanent, you need to fix the fault first, only then can you clear the code - maybe the suppliers themselves need to explain this better when they sell the items to avoid confusion though even then many people fiddling with their cars won’t read the instructions anyway. Then I’ve read reviews like “They claim it has bi-direction control over the ABS system but it doesn’t!” - well actually the car you’re using it on probably doesn’t even support bi-direction control even with the factory scan tool - please keep that in mind. I scan cars every day at work, no one scan tool does the job better on everything than any other one scan tool. each has their strengths and weaknesses. The Autel Maxisys is one of our newest tools and does regular online updates automatically plus multiple functions on a wide variety of cars - but the older Autoland finds modules in Nissans that the Autel can’t, plus it can scan some 24 volt trucks! Then there’s the Fcar that can scan just about any 12v car or 24v truck - but isn’t as good as the Autoland on Nissan cars: My point? Even with high end gear you need several scan tools to cover all your bases - perhaps 99.9% of your bases because there will always be that special function that only the dealers can do - unless of course you spend a few thousand dollars more perhaps - only to find out that the agents in Europe won’t give you the access numbers to recode that module to an Audi with your new scan tool- back to the dealers I suppose. There are some cases actually where you are just better off leaving it to the dealers - like the left read airbag module we got for a BMW - the dealers couldn’t even code it to the vehicle until they worked out that all the other modules on the car needed 10 years worth of software updates approved by the “big guys” in Europe, before they would communicate - something we could never accomplish even with the right tools. 2.) The budding mechanic who wants to try it out on several vehicles and help his friends [for a fee perhaps]. 3.) The workshop wanting to have “something for the work vans” that doesn’t cost as much as the professional gear. 4.) Possibly: The new workshop who sees the benefit of buying several budget scan tools that cover just about everything as opposed to spending $4000 a time per professional scan tool that does 95% of what they need - and needing to have one for 12v and one for 24v . There’s always the dealers for the tricky jobs if you’re in a big town/city. I have researched several models and test them out at work every day to see what they are capable of. In the USA scan tools are advertised as working on vehicles “from 1996 onwards” which is easy enough when obd2 was introduced in that country in 1996 - all you have to have is a scantool that does obd2 and you’re pretty well covered for general repairs. Not so In New Zealand and several other countries where obd2 didn’t come into effect that early. Some countries adopted obd2 as late as 2008 so for many people the other considerations are “Does it do obd1, Australian Ford and Holden, JOBD [Japanese OBD]?” - these are all strong positive additions to the ‘standard OBD2’ that they all cover anyway, and certainly add to the attractiveness of a new scan tool. Autel: [Reminds me of Microsoft] Our workshop has an Autel Maxisys something-or-other that has a really cool wifi update that just lets you know when updates are available and you download and install them at the tap of an icon. But since the last OS update it occasionally can’t scan a vehicle because it says “diagnostic process already running”. The dealer told me to click on the little car icon and it will be stuck on the last vehicle you worked on and then log out of that. Not so, the only way to get it working again is to do a reboot [like Windows]. The two Autel AL539s we got for our workshop both changed to a weird machine language when we did updates on them and we had to contact the supplier for step by step instructions on getting them back to English. Someone told me that the AL539B they ordered after reading my blog lost all its icons after its first update. The MD805 multi system scanner I got would get into a Lexus LS430 and tell me what engine it was but go no further. I did an update while waiting for help from the supplier and after that it wouldn’t even log in to the vehicle automatically and ‘LS430’ disappeared from the menu. After a few days back and forth I was instructed to first log in to Asian vehicles, let it do its scan, then go to manual vehicle selection and go to USA models! Well maybe that’s how to get there but with modern technology we’re kinda paying for “the latest” to do that kind of thing for us aren’t we? After all it could find the vehicle on its own before the update [Microsoft]. After all that though I was reasonably impressed that it could do a full system scan and find 26 modules! That’s value for money but ‘like pulling teeth’ to get the job done! [Microsoft] 6/12/2018 I scanned a BMW 750i and found 54 modules with the MD805. I was able to the whole job on the car with the MD805. Autel MD805 - notice the reference to the Launch CRP123. However: The AL539 was an eye opener for me - having mainly scanned for fault codes before and not paying much attention to the I/M readiness [Internal Monitors] function on all the other scan tools this unit has an I/M “hot key” and I now check every vehicle “just because”. The display is really cool and shows everything available [and not available] in “pictures” along with colours that help you see what is and isn’t good - and a green-orange-red display that let’s you know, without even entering into the rest of the ECU, whether things are good, suspect, or bad in the system! What first struck me was the fact that I/M readiness showed that HRT [heated oxygen sensor] was not good. I checked live data and there was no activity at the oxygen sensor and obviously zero short term fuel trims because it had nothing to work from. These ecus don’t throw a code for a faulty oxygen sensor strangely enough. I wouldn’t have known if I had simply scanned for fault codes. Then, while I was watching the display of the I/M I saw a pending fault code appear for a valve that wasn’t connected [had been removed] and after 30 seconds I saw “2” appear under dtc. [diagnostic trouble codes] - all things that I would have had to re-enter the ECU and scan again using a bigger scan tool. Since the check engine light wasn’t coming on right away as well these things were all so handy to have just “popping up” while watching the I/M display. [The two fault codes were for VVT control because someone put the engine back together without checking cam timing correctly]. I may be going on a bit here but “a picture says a thousand words” and it is really refreshing having a colourful representation of what is going on compared to the boring “government hospital” layout of most I/M readiness displays on other scan tools. Foxwell [reminds me of Apple products, BUT at a reasonable price!]. Solidly built, reliable, does what it’s made for well and at a good price! I bought an NT630 Elite after trying out a friend’s model. Powerful little tool indeed! The Lexus I was working on ran the battery flat while trying to get the Autel MD805 to scan it -grrr! When I went for a test drive after jump starting it the traction control light was on. I scanned the ABS system with the Foxwell and it told me the module had “lost zero point calibration”. I went another step and found “test mode”. After running test mode the traction control light was off and we were good to go! Supports AU Ford after 2003. Foxwell NT630 - notice the reference image showing “others” which is an image of a Launch CRP123. Now is a good time to discuss the Launch CRP123. It’s really the benchmark of budget scan tools. As can be seen in the last two images when you start reviewing the better budget scan tools you will often see the CRP123 mentioned along with statements as to what else the advertised tool does beyond what the CRP123 does - never any statements like “does better than” or “more reliable than” because the launch really does its job well, and covers a wide variety of vehicles. The Foxwell adds SAS and ABS reset modes beyond the CRP123’s capabilities but doesn’t cover things like AU Ford and JOBD. My advice is to go for the higher level CRP129 which does have those functions - at twice the price of the Foxwell NT630 mind you, but also does automatic transmissions. The Launch can also display 4 graph data streams while the Foxwell can only do 2 at a time. Not a dealbreaker for me because 2 graphs is enough for most jobs and beyond that the screen just gets messy. If I were buying my first budget scan tool I would start with the launch crp129. Launch has always meant reliability for me - until I ordered the new CR3008 that arrived a week ago. It scanned half the vehicles I tried it on though admittedly New Zealand gets quite a selection of vehicles, many of which aren’t obd2 compliant. But most of the vehicles it couldn’t scan the Foxwell Nt630 could, as could the Launch Creader VI+, so it should have done better. At first I thought it was because the one corner pin was shorter than all the others but the supplier assured me it as “Launch design” and I worked out that it was the B+ terminal so if the tool was turning on then it must have been making good contact. I soon lost confidence in the tool, got a 50% refund on my purchase and got the other 50% back by selling it at a good price. If Launch want to bring out a “new release” it should a least be able to keep up with the old models. Today, 14/12/2018 my Nexas NL102Plus arrived and first thing I did was plug it into my 2006 Honda Stream. It was able to scan it and get graphic live data which is already better than the launch 3008 I got rid of. In New Zealand not everything is obd2. compliant so many of the cars like my Honda that come from Japan as used cars can be tricky to scan with budget tools. This scan tool has me very excited because it is 12 and 24v and does several systems. It also supports oil light reset and DPF regeneration. On Monday when I’m back at work it is going to get a full test! 17/12/2018 Today I listed 10 vehicles in our workshop: Japanese vehicles pre obd2: 1998 Toyota Harrier, 1995 Rav4, 2007 Toyota Dyna, 2004 Honda Odyssey, 2002 MMC Smart K, 2001 Toyota Hilux, 2006 Toyota Auris. Then there was the 2000 Ford Falcon which is “AU Ford”, a 1988 BMW 320i and finally a 2015 Jeep Cherokke which was the only obd2 vehicle out of the 10. The others had obd plugs but they were obd1. The Japanese imports were all pre 2008 meaning they had not gone full obd2 yet. That’s what we have to deal with. In the USA one ond2 scan tool would have been able to scan 9 of the vehicles because over there everything after 1996 has to be obd2. 21/12/2018 My Nexpeak NX501 arrived. It is a well made tool and so far the best ‘feel’ when the buttons are pressed. The “mode 6” or “I/M readiness” display is nice and ‘graphic’ as with the Autel Al539 compared to the boring numerical display of most other scan tools. I asked them about the fact that some pictures show the front with text saying “obd2 and obd1” but they tell me they are now only “full obd2”. For the price also having obd1 would have made it a real bargain. I was keen to see if it could print graphs as the listing suggested on Aliexpress. Not so. I contacted them about the misleading nature of this image - it shows a graph being printed and I can imagine that being a hit with customers - “a picture says a thousand words” as opposed to a list of numbers you have to decipher. It would be really cool to be able to show the customer something like changing fuel trims compared to engine revs and I’m pretty sure they would be impressed and gain more confidence in our abilities. I did everything I could to try to print out a graph and then contacted support who told me it is not possible - the “media department is responsible for the pictures in the listing” and they thought they were being clever by showing a graph being printed. I gave them a 3/5 star rating for “item as described” but 5/5 for service and didn’t request any compensation - I just expressed my disappointment in it’s inability to do what had caught my eye in the listing and they have “promised” to change the offending image - after all it certainly suggests you can print graphs. All of that aside it is already one of my favourites now - the graphic I/M readiness display, the green-orange-red lights showing “pass” pending code” and “fault code” on the front which means not even having to scan the vehicle again to find out that a code has appeared and the superb feel of the buttons. Whenever I think of buttons on these scan tools I think of the awful squishy buttons on the Launch Creader VI+ which require what feels like twice the movement of squishyness of other tools to be pressed down before you have to push harder to get a ‘click’ - if it wasn’t for the fact that all of the buttons feel the same I would have concluded that something was broken on my Creader. This also reminds me of how dark the Creader display is - I dug into the menu to see if there was a setting for brightness but there isn’t. But I digress - I wish all my scan tools had the same feel as the buttons on my NX501. Speaking of buttons - most of these tools have a “shutter delay”. I’m now comparing them to budget digital cameras where you aim at the subject, push the button, and then the subject steps out of the way just before the shutter finally goes “click” and takes a picture of …. nothing. The Autel and Foxwell come to mind right away, you want to scroll down the screen and click the button several times and there is such a lag you end up going one or two lines lower than you wanted. You have to either click slowly and wait or count the exact number of clicks required and push the button that many times then wait - which is a rather ‘disconnected’ way of working with the tool. The Nexpeak has a fast enough response that it doesn’t leave you wondering if you just pressed the button and it’s about to move down a line or not. The ‘beep’ is also pleasant enough that I didn’t bother about going into settings to disable it as with most of the other tools that are loud enough to be heard in a noisy workshop - meaning that when the shop isn’t noisy the beep is just plain annoying. Graphs: The Nexpeak 501 is the clear winner here, up to 4 graphs at once “moving smoothly” across the screen. The Autel 805 can show two graphs, one above the other, or “merge” the two but they are still jumpy and out of phase so if you are watching short term fuel trim and oxygen sensor readings at the same time they take turns at refreshing which is annoying. The Foxwell has quite a nice display of the graph [two only] but the lag on its buttons really annoys me - you have to wait a while between clicks to see where the cursor lands. When I’m using the Nexpeak I don’t even think about any of these issues, when I pick up the other scan tools I immediately start thinking of how I have to work around their limitations. The Autel MD805 is not bad on the graphs, the refresh rate is reasonably fast so that when you’re viewing two screens, one above the other [there is also an option to merge the graphs as well], it’s not as irritating as the Foxwell NT630 which “marches” the screens, left right left right left right…. and makes it hard to follow because your concentration goes up down up down up down…..
8/1/2019 Today we had a 2002 Holden VX in the workshop. The Autel MD805 was the only one that would communicate with it. 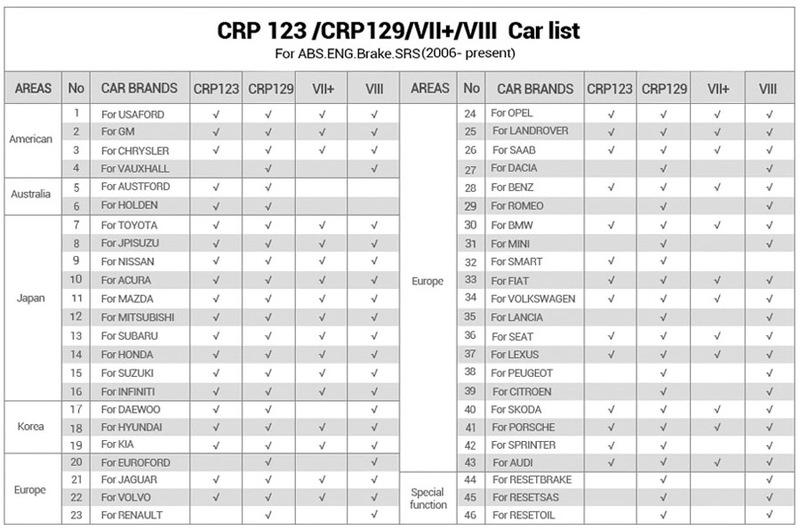 The Launch CRP123 only goes back as far as 2005 on Holdens. With regard to “button lag” the reason why the Nexpeak is the smoothest to work with is because it only acknowledges a button press once it has moved to the next line from the previous button press. In other words you could press it 5 times very fast but it will beep once and when it has moved to the next line it will accept another press[presses] to move to the following line - which makes it easier to get where you want to go without ‘overshoot’. The other tools will give you 5 beeps if you press it rapidly 5 times and then eventually get 5 lines down - which results in a lot of overshooting the target because you keep pressing the button to get lower down the screen. At the moment, if I had to choose only one budget scan tool it would be the Autel MD805 because of the wide range it covers and its ability to scan 54 systems. If I was only working on engine faults and every vehicle was 0bd2 in our workshop [highly unlikely in the New Zealand vehicle environment] I would take the Nexpeak NX501. It’s smooth operation, graphic I/M readiness mode and smooth moving 4 graph screen are the winners in the budget scan tools department. 20/01/2019 Today I used the Autel AL 539 multi-meter function and for no real reason clicked on “review data” first to see what saved info looked like from my last obd2 scan. The menu flashed quickly and switched to Spanish or some other language - I double checked my settings and it is set to English which of course is what the main menu showed anyway. Autel products seem to be fraught with bugs.